When you have a dead animal in Lake Oswego, Oregon who do you call to remove it? We are able to come out and remove dead animals from your property as well as sanitize the area if needed. The most common dead animal removal in Lake Oswego call we get is for a bad odor coming from under a house. When you have a dead animal under your house, most likely it has crawled up into the insulation. This can make it more difficult to locate as well as create more odor inside your house because it is directly below the floor. We always recommend having it removed as soon as you notice a problem, the longer you wait the worse the smell can get. It is very important to never remove dead animals without properly safety equipment because they can carry dangerous diseases and germs. Disposing of the carcass is also an important factor when solving these problems. This will prevent the spread of disease to other animals and humans. We are able to also sanitize and deodorize areas after the dead animals have been removed. Besides the risk of disease and germs, the seconds biggest problem with dead animals is the horrible odor from the carcass. Although when the animal is removed alot of the smell does go as well, for more extreme cases the smell can stay around for a long time. We are able to deodorize in your house, in your attic, under your house with our professional deodorizer. We use a food grade deodorizing solution that makes it children and pet safe. This is not just an odor cover up, it knocks down the odor and kills what is causing the odor. During extreme weather and for many other reason's an animal might die on your property. The most common areas outside of the house to find a dead animal is in your yard or under a shed. If you find a dead animal in your Lake Oswego yard we recommend you contact a professional to make sure it is done safely. When an animal dies and it starts to decompose the possibility of bacteria and other disease increase. 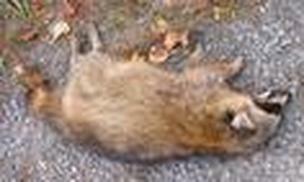 We are able to provide Lake Oswego dead animal pick up along with sanitizing the location.